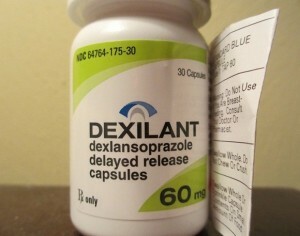 The medication Dexilant is a name brand version of the drug dexlansoprazole; these drugs are members of the drug group proton pump inhibitors. Dexilant (dexlansoprazole) treats conditions caused by excessive stomach acid by decreasing the amount of acid produced in the stomach. When a person experiences heartburn or has erosive esophagitis it is caused by ineffective operating of the valve that connects the stomach and esophagus; the result of this is that acid from the stomach is allowed to flow up into the esophagus repeatedly, causing irritating and painful conditions. Dexilant works by turning off the multitude of tiny pumps releasing acid from the stomach. Dexilant is available in a Dual Delayed Release capsule; this capsule contains two different types of granules in one pill. The first release of medication occurs about one hour after taking the capsule, the second dose of medication is released four to five hours later. Dual Delayed Release capsules should be taken whole, breaking or opening the pill could cause too much medication to be released at once. If you cannot swallow the capsule whole, open it and sprinkle contents into applesauce; swallow the mixture immediately without chewing and discard the empty capsule as well as any unused mixture right away. Dexilant is used to treat gastroesophageal reflux disease, known as GERD, which causes heartburn and to heal damage that has occurred to the esophagus as a result of repeated exposure to stomach acid, a condition called erosive esophagitis. Dexlansoprazole is generally prescribed as a short term medication; the drug typically requires 4 weeks to treat heartburn and may need several months to heal erosive esophagitis. This medication is available as a Dual Delayed Release capsule and should be taken exactly as prescribed; this medication should not be stopped early even if symptoms improve.